This Niagara White Earth® Showerhead limits water flow to just 2.0 gallons per minute (gpm), while the adjustable spray delivers either a broad, rain-like spray or a focused, massaging spray. 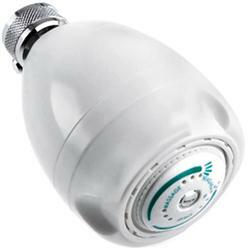 The non-aerated spray mean less temperature loss between the showerhead and you. Self cleaning. Consists of a plastic showerhead, white finish and chrome plated brass collar. Standard 1/2" inside threads.